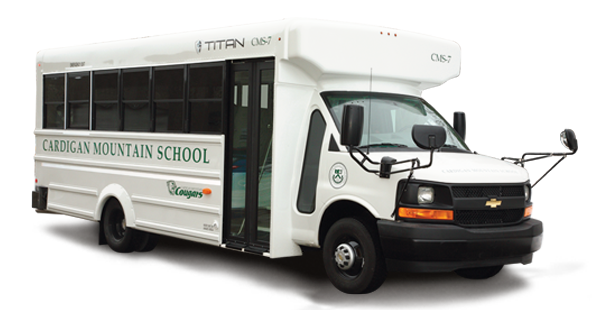 Titan Bus is a new entry into the type A school bus market. Though the company and products are new, the people behind Titan are not. With over 100 years of manufacturing and school bus industry experience, Titan Bus will provide outstanding products, customer service and superior quality. Striving to be a company that is easy to work with for both our dealers and the end user. 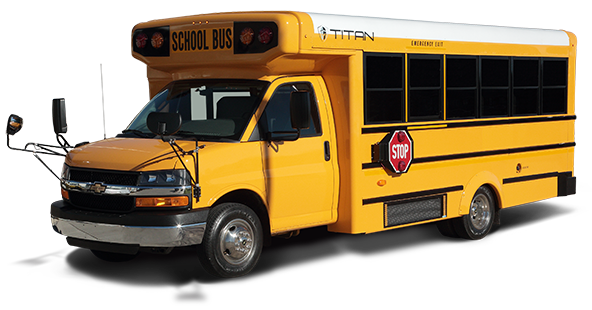 With vehicles ranging from nine to thirty passenger capacity, Titan Bus provides transportation solutions for a variety of end-users from public schools and private contractors to community groups/organizations and child care centers. 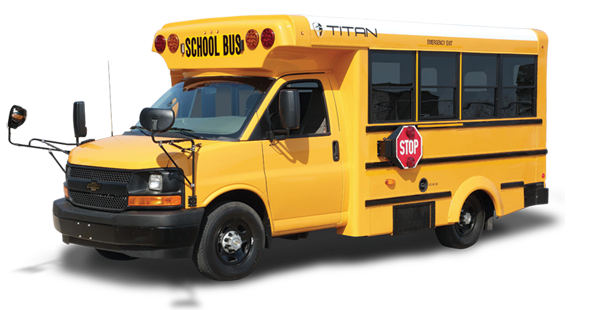 Incorporating the latest technology, Titan Bus is a true industry leader in the Type A School Bus market. Titan Bus Dual Rear Wheel (DRW) model bus is a new standard in the Type A school bus market. Designed with 92 inches of interior width which allows for a 14-inch aisle (with standard 39” seats) offers more room for children and adults to navigate the aisle. An all Galvanized steel cage construction provides all of its occupants a safe secure ride. Our state of the art electrical system takes the old model rocker switches and replaces it with a modern touch screen and advanced electrical control nodes. The flexibility that the system provides allows many options to be added without making huge additional changes to the electrical package. Titan Bus Single Rear Wheel (SRW) model bus is a new standard in the Type A school bus market. Designed with 83 inches of interior width which offers more room for children and adults to navigate the aisle. Our state of the art electrical system takes the old model rocker switches and replaces it with a modern touch screen and advanced electrical control nodes. The flexibility that the system provides allows many options to be added without making huge additional changes to the electrical package. This SRW model offers a maximum capacity of 20 passengers and has a number of floor plans, layouts and options to choose from. MFSAB (DRW or SRW) model is model offered by Titan Bus designed specifically to meet the transportation needs for School Activities & Community Groups. An all Galvanized steel cage construction provides all of its occupants a safe secure ride. Our state of the art electrical system takes the old model rocker switches and replaces it with a modern electrical touch pods and advanced electrical control nodes. The flexibility that the system provides allows many options to be added without making huge additional changes to the electrical package. ©COPYRIGHT 2018, Titan Bus Inc. ALL RIGHTS RESERVED.